Struggling for some unique date ideas for Valentine&apos;s Day? We&apos;ve got you covered. Or, are you flying solo and trying to find something fun to do on Singles Awareness Day? Not to worry-we&apos;ve got something for you, too. Love-struck diners seeking a classic dinner for two can&apos;t go wrong with The Driskill Grill, a historically romantic restaurant dating back to 1929, where dark leathers and gilded touches set the mood. 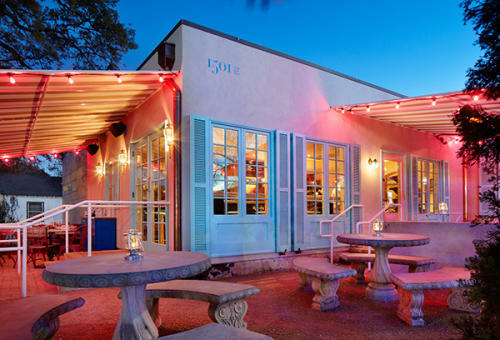 For a charming restaurant that oozes romance, book a table at Al Fico, an east Austin Italian osteria featuring wood-fired pizzas, entrees & wine in a warm, convivial space. Trendsetting couples will love the chic vibe and artisanal dishes served in three-course, prix fixe format at Lenoir. A more casual yet quaint option is Botticelli&apos;s, where you can grab a cozy booth or sit under the twinkling lights in the backyard garden while enjoying classic Italian dishes. Or, skip the traditional Valentine&apos;s Day atmosphere altogether, and pull up a seat at the colorful and eclectic Elizabeth St. Café, a quaint boulangerie serving up classic Vietnamese dishes and French pastries. Looking for an offbeat way to celebrate? Take your date to Peter Pan Mini Golf, a vintage putt-putt place with larger-than-life characters dispersed throughout the 18-holes. It&apos;s even BYOB, so you can bring a tasty adult beverage to "cheers" with your honey while pulling off impressive golf moves. If golf isn&apos;t your game, try a game of ping-pong in the upstairs space of The Continental Club Gallery. After a heated round or two, you can peruse the art hanging on the walls, and then head downstairs to enjoy a high-octane cocktail while listening to roots, rockabilly and swing in the dimly lit music club. For a bit of a show, watch belly dancing while filling up on Mediterranean dishes at Phara&apos;s, or go old-school romantic with a trip to Blue Starlite, the world&apos;s first and only mini urban drive-in movie theater. Not feeling the ooey gooey love fest, but still looking to go out and have a good time? Singles ready to mingle will find plenty action in Austin. Skip the special V-Day menus and nosh on authentic New York-style pie at Home Slice Pizza. Bowl a round at The Goodnight. Sing your heart out at Alamo Drafthouse&apos;s "Love Bites" annual sing-along. Catch a live honky-tonk show at The White Horse, or get dolled up and dance all night at eclectic Barbarella or LGBT hot spot Rain on 4th. Pictured: Elizabeth Street Cafe. Photo by Casey Dunn.